Every now and then I come across a DIY that I am absolutely obsessed with… a DIY that I would even pay decent money to buy in a store. And let me tell you, this was one of those DIYs for me. First off, I’m obsessed with wreaths, and secondly, I love Christmas. 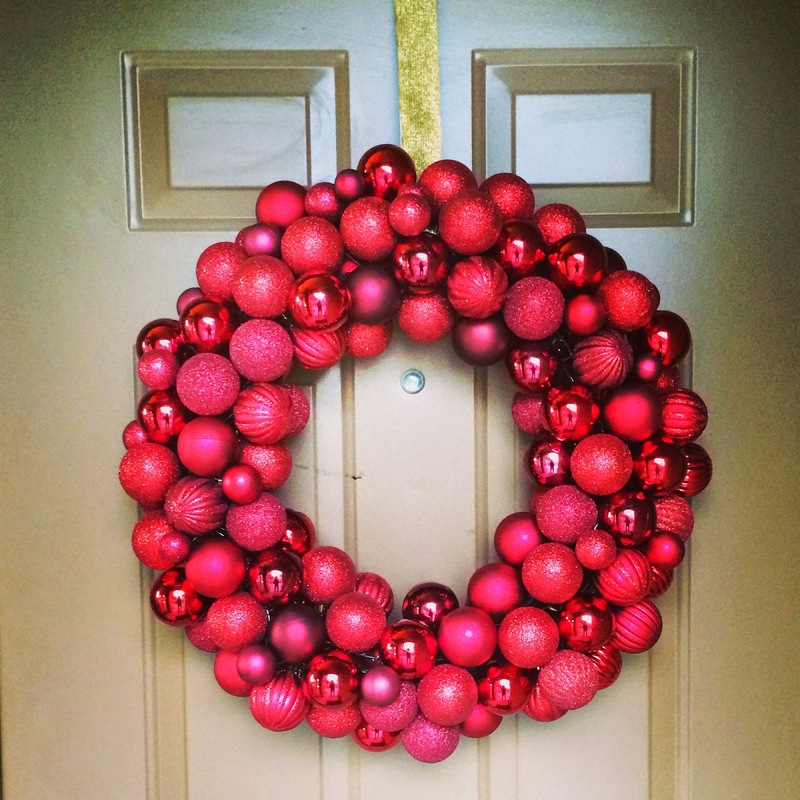 So what better DIY than a wreath that uses Christmas ornaments?! This has been on my to-DIY list for quite some time, and I am so excited about how it turned out! 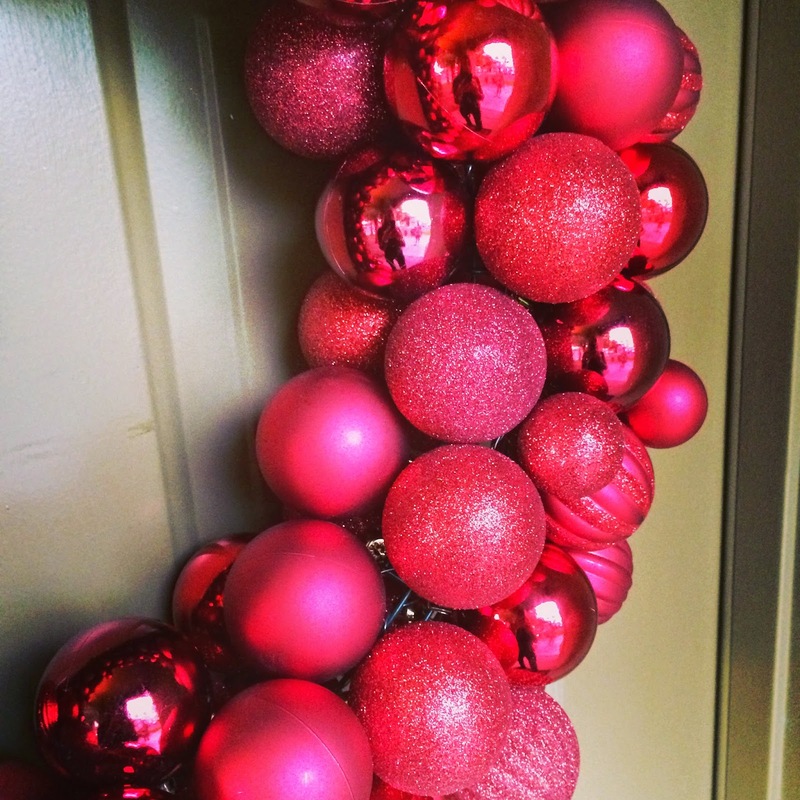 Most ornament wreaths use a hot glue gun to glue bulbs/ornaments to a Styrofoam wreath frame. I love the way they look, but I was a little bit concerned about how the wreath would hold up over several years. Instead of hot gluing ornaments to a frame, I decided to use a wire frame and attach the bulbs to the frame using wire. It was a bit more time consuming, but equally easy! All in all, I used about 200 Christmas bulbs… it sounds like a lot, but I made quite a large wreath. Walmart sells huge assortments of plastic bulbs for super cheap, and they are even color organized which is great! 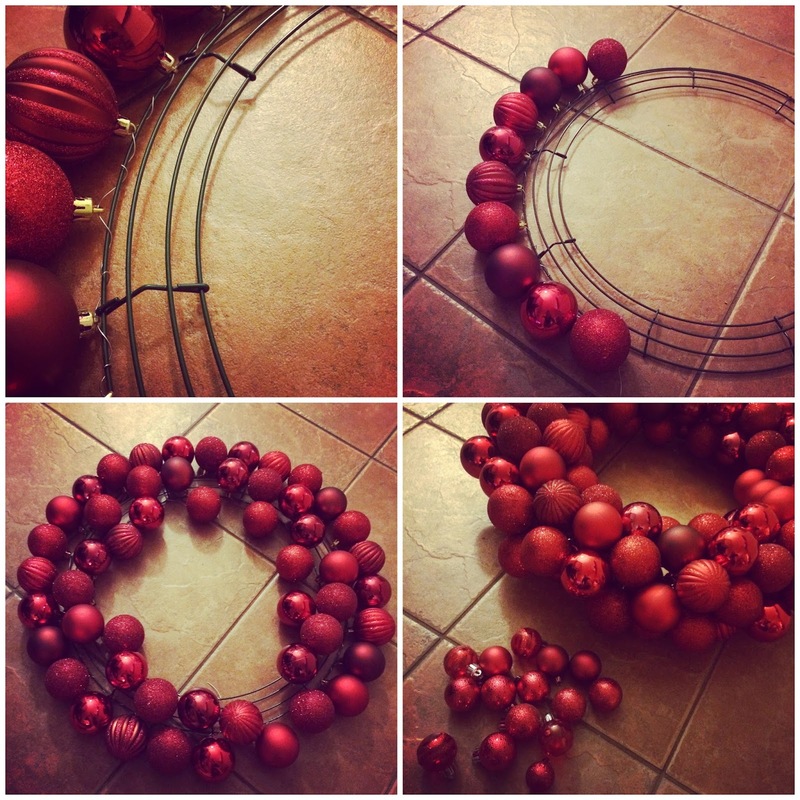 Begin by cutting a long piece of wire and anchoring it to the wreath frame (by twisting the wire around the frame). String on an ornament, and then wrap the wire around the frame two times to secure. Continue this process (stringing on an ornament and wrapping the wire two times) until a single layer of Christmas bulbs is around the frame. Next, using the same method, start attaching Christmas bulbs to another layer of the frame. It takes a couple tries to get a rhythm, but once you get going it isn’t difficult. Continue to add more and more bulbs until the frame is full. Once the frame is full, you can fill in any visible holes with smaller ornaments and secure with wire. The bulbs anchored to the sides of the frame may move to the back of the wreath, but just continue the process and you will end up with a full and thick looking wreath that will last you several years to come! 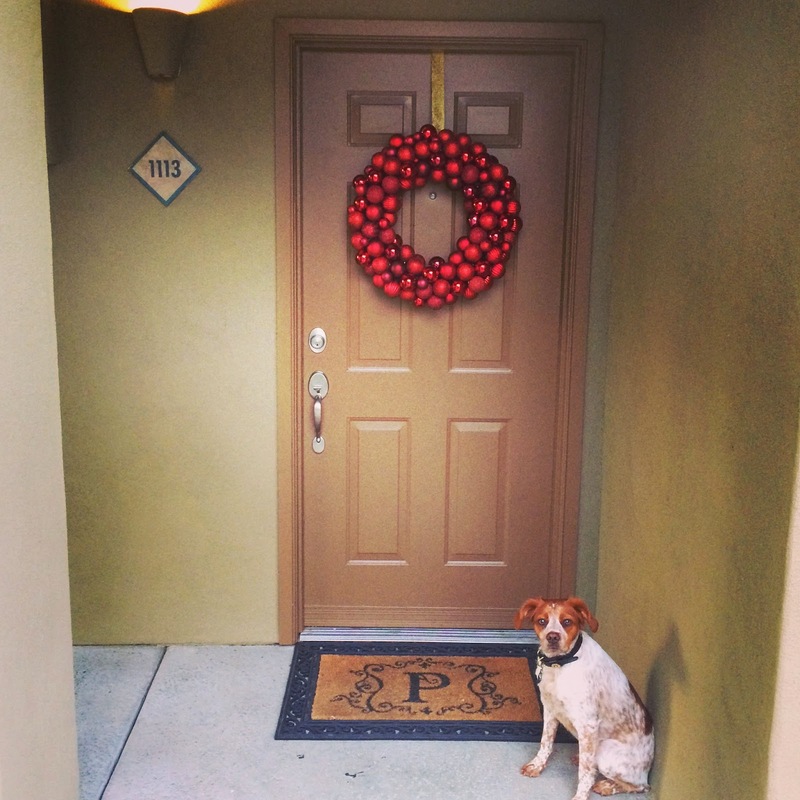 Add a ribbon (or not) and hang from a door using a standard wreath hanger. It took a few hours to complete, but it is a perfect DIY for when you’re watching a Christmas movie and drinking a glass of wine! This looks so good!!! I've definitely been wanting to try this!! This looks incredible!!! I never thought to make one with wire and...pure genius girl!!! Love it! I made an ornament wreath last year with the foam and hot glue, so far so good! But I'm so with you, it looks better than anything you'd buy in the store- I love my ornament wreath! I love that you went with all red - so pretty! This is FANTASTIC!!! I just love all the different reds. Remember when Target used to sell sleeves of like 8-10 ornaments for $1?! I pulled them all out this year, still in the original packaging, and was so sad. They've gone up like 10-20x in price! Wow, so pinning this! A few years ago I bough two wreathes like this from a local florist and we love them and now i want to make some in other color schemes! Oh I love this! It's so pretty that you used glitter and non glitter ornaments - and the pup is adorable too :) they put up with their blog moms and all the picture taking so well, haha! I love this! I need to make one! It's so great! Cute! And so simple, love it. Love it! I need a new Christmas wreath so may just be adding this to my list this weekend! OMG I love this!!! And the technique you used looks like it will definitely hold up longer than others that I have seen. When these first became really popular I attempted to make my own and instead of styrofoam used a wire hanger and purchased the ornaments from the dollar tree. Neither of which I would recommend because for one I could not get the wire to stay in the shape of a perfect circle and two the ornaments were cheap so they kept popping off the metal (well plastic) hook thing at the top of the ornament that the hook goes through. I was so frustrated with it but I am going to give this a try (: Thanks for sharing! It turned out amazing! What was the total cost for supplies? Looks great! :) Great idea to use wire . . . there's no avoiding getting burns with hot glue guns! Wow - love this! It is huge, too! Good call on not hot glueing!! That's what I did a couple years ago and it broke in storage after all my hard work. :( Yours looks gorgeous though! It turned out beautiful and so festive!! What a perfect DIY- I am impressed! OMG! Where was this tutorial last year??? 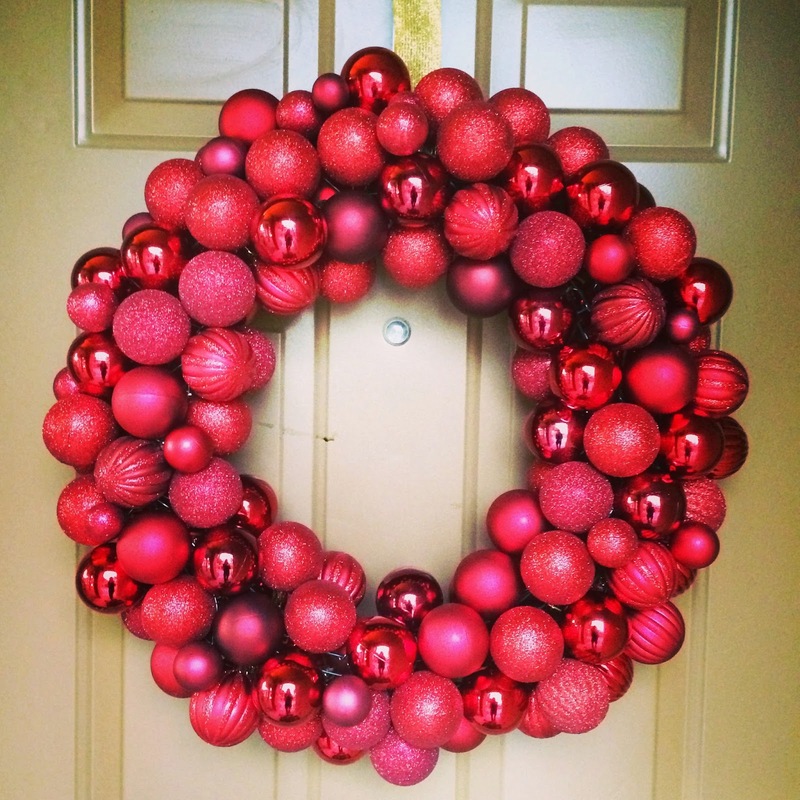 I made a wreath like this and it was my most epic DIY failure to date. Taylor and I bought tons of gorgeous balls and that base and tried to hot glue them on. As soon as one would stick, the rest would pop right off. There was not enough surface area on the base to adhere the ball to with glue. Needless to say I threw it all in the garbage and bought a wreath. Yours looks amazing though! I didnt think to use wire! So pretty!! Your wreath looks awesome! You are so crafty with your DIY projects! Beautiful! This totally looks like the fancy ornament wreaths I've been seeing in stores...great job! What a great idea with the wire! it's beautiful!